1.Qualcomm Add Vivo NEX/23/Z3 (AT) Factory Reset/Account Remove Support. 2.Qualcomm Add Vivo NEX S/Vivo NEX/Vivo Z3/Vivo X23.. Factory Reset/Account Remove Support. 3.Qualcomm Improve Safe Reset in EDL Mode. 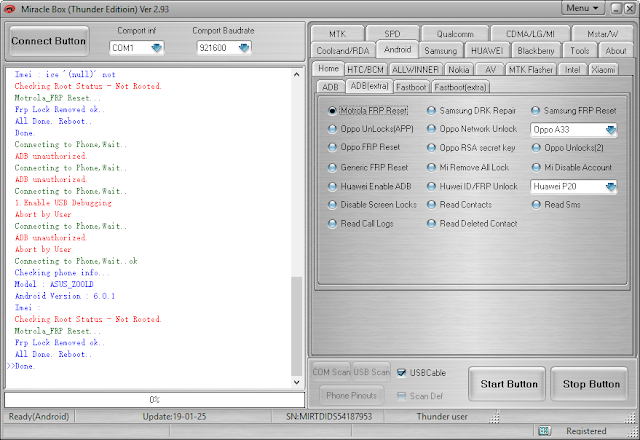 4.Qualcomm Fix Some Loaders in EDL Mode. 5.MTK Fix some DA in Download Mode. 8.Add MTK & Qualcomm Add News 100+ Models Support. 0 Response to "Miracle Thunder v2.93"